wonderful ways at the Johnson GEO CENTRE. The Johnson GEO CENTRE is a geological interpretation centre located on Signal Hill in St. John’s, Newfoundland and Labrador, Canada. It is a not-for-profit organization, and a registered charity. The GEO CENTRE’s mission is to educate and inform the public on the importance of Newfoundland and Labrador’s geology, and to foster curiosity in science and the world around them. Since the Johnson GEO CENTRE opened, it has continued to expand its exhibits, programs and revenue. The Johnson GEO CENTRE has made great strides to provide valuable contributions to the science, engineering, and education communities. 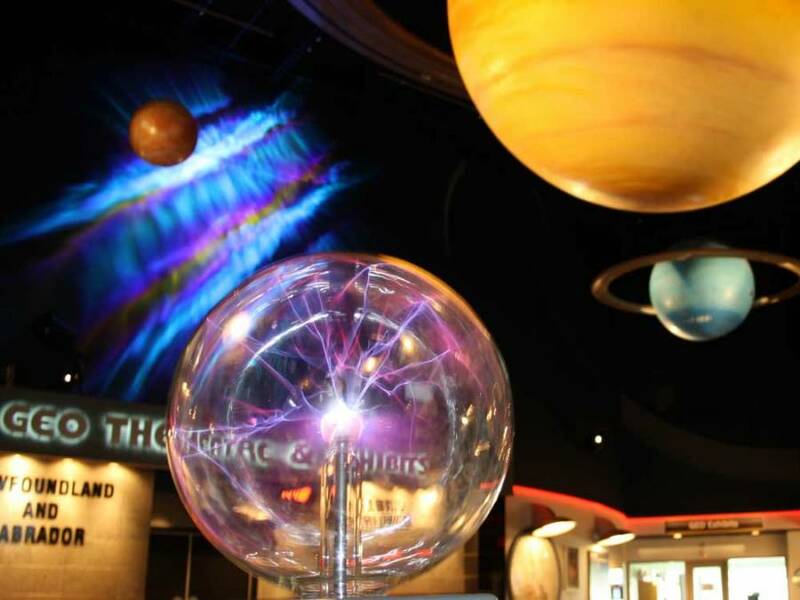 Our exhibits engage and inform visitors about Earth Science topics and concepts, and our GEO CLASSES provide fun, hands-on learning experiences based on approved curriculum. Our Edukit provides educational outreach, and we are continuously searching for new ways to educate students and visitors in the geosciences. Consistent with our focus on promoting care for our planet and its resources, our facility incorporates state-of-the-art geothermal heating technology. Teachers are informed of our class offerings through mail-outs and email notices, and we also avail of public service announcements, and radio and television advertising to increase public awareness of our facility. The Johnson GEO CENTRE is a member of the Newfoundland and Labrador Museums Association (MANL), the Canadian Association of Science Centres (CASC), the Association of Science and Technology Centres (ASTC) and the Canadian Museums Association (CMA). The centre partners with the Petroleum Engineers and Geoscientists of Newfoundland and Labrador (PEG-NL) each year to increase science awareness during National Engineering and Geoscience Week. We have also established relationships with the Canadian Space Agency, and most recently with the Canadian Broadcasting Corporation to assist with the launch the Geologic Journey documentary series. Through its Board of Directors, specific new initiatives have been proposed annually and all of these have been met. The GEO CENTRE currently receives no government funding for its ongoing operations and its new initiatives. It has had, since its inception, the strong financial backing and administrative support of the Johnson Family Foundation in maintaining high quality programs and exhibits. The Foundation has contributed more than $100,000 annually to the GEO CENTRE and its various programs and initiatives. In 2007, the GEO CENTRE entered into a management agreement with Memorial University, which will ensure long term financial viability, cost savings, increased revenue, new programs, and new partnerships. The GEO CENTRE has also partnered with the private sector, most notably Exxon Mobil Canada, to develop a new Oil & Gas Gallery and to initiate and sponsor travelling exhibits from elsewhere in Canada. The GEO CENTRE has received funding from the Canadian Geological Foundation for its outdoor exhibit, “Rockscapes.” There are also annual fundraisers which are strongly supported by the local business community. The Johnson GEO CENTRE is on a strong financial footing with no significant long-term debt. It has the support of the general public, school groups, the tourism sector, the City of St. John’s, the local scientific community and the academic community. It is a key attraction in the capital city of Newfoundland and Labrador and is open year round. It has a core of professional staff who are very dedicated, and an excellent Board of Directors, to provide vision, guidance, and strategic direction. The recent management agreement with Memorial University will serve to enhance all of these factors.